MONDAY, Feb. 26, 2018 (HealthDay News) — Many breast cancer patients say they’ve heard scary stories about radiation therapy, but their actual experience is usually better, new research finds. The study of more than 300 women who underwent breast radiation found that almost half had heard “frightening” stories going into treatment. But only 2 percent ultimately agreed that the stories were true. And over 80 percent of all patients said their experience with radiation therapy was actually “less scary” than they’d expected. Researchers said the findings show that the public still has misconceptions about “modern” radiation therapy. “The word ‘radiation’ itself sounds frightening, and it’s associated with many negative news stories,” said senior study author Dr. Susan McCloskey. It’s more precise and shorter in duration — which has helped limit short-term side effects like skin burning and breast pain. Doctors can also now create individualized radiation plans for each patient, and give the treatment in “more convenient” schedules, McCloskey noted. She said that in her experience, it’s “extremely common” for patients to go into treatment having heard scary stories. The side effects of any cancer treatment will vary from one person to another. But McCormick said it’s possible to predict what women can typically expect. What’s important, she added, is that women have a thorough discussion of the benefits and risks of radiation therapy when making treatment decisions. “That discussion should start with their surgeon, who is usually the first [doctor] a woman will see,” McCormick said. The study findings were based on 327 women who’d been treated for breast cancer within the past several years. They’d had surgery, followed by radiation — usually a lumpectomy, though 17 percent had undergone a mastectomy. Overall, 47 percent said that before starting treatment, they’d read or heard “scary” stories about the effects of breast radiation. And many went into treatment worried about risks like skin burning and damage to the internal organs. In hindsight, though, few women felt their experience matched the stories they’d heard. Instead, 84 percent said their side effects — including skin symptoms, pain and fatigue — had been less serious than they’d expected. Similar percentages also said their treatment had been less disruptive to their work and family life than they’d feared. The long-term outlook was better than most women had thought, too. Of women who’d gotten a lumpectomy, 89 percent said the appearance of their irradiated breast was better than they’d expected. 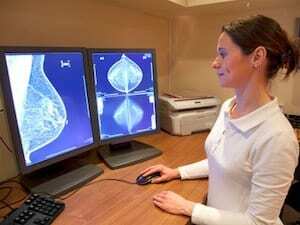 Similarly, 67 percent of mastectomy patients said the appearance of the radiation-treated area was better than they’d anticipated, according to the report. In the longer term, chest radiation carries a risk of heart or lung disease, since it can damage those organs. But recent research shows that among nonsmoking women who receive breast radiation, less than 1 percent ultimately die of heart disease or lung cancer, according to McCloskey’s team.